PlayStation Meeting Live Streaming: Sony’s Playstation official meeting is going to be conducted today at noon Pacific / 3 PM Eastern around the world. The event is one of the most awaited events of this month following the launch event by Apple. With the announcement of Playstation Neo, it’s also expected that the company shall also launch GTA VI and The Last of US 2, which was the most awaited game of the year. Modern Warfare is also one of the important topic discussed a week ago. The other things which could be considered include deployment of the new network for faster gaming speeds across Asia. A slimmer version of Sony’s world famous product, Playstation Slim, which was leaked a month ago could also be announced as a significant relief to the gamers who loves to travel. Other important announcements to be made includes an update for Windows and Mac remote play application as it found using the Internet instead of Intranet to make it possible. The system hanging problems while playing Android applications and casting of the screen of any mobile phone could be the next potential hitch. Hardware upgrades are less expected. PS 4 has enough hardware to handle a bunch of advance games. There is a possibility that Sony may introduce new hardware for upcoming games and 5D experience. New consoles are always the most expected thing during this release. One thing fans were demanding from very long was to waive off the charges to use PS Plus or to introduce new games in the catalog. It doesn’t appear that Sony is any more interested in considering these demands. An issue identified last month with login page as many users around the world were not able to access their membership page restricting them from using the PS. The company may roll out new update giving less compromise with the features accessibility. Starting time: The streaming will be provided from The Playstation theater in New York. You can catch it live on San Francisco: 12PM / New York: 3PM / London: 8PM / Berlin 9PM / Moscow: 10PM / Beijing: 3AM (September 8th) / Tokyo: 4AM (September 8th) / Sydney 5AM (September 8th)/ India 0:30 AM/ Pakistan 0:00 AM. Live blog: Stay tuned to this page. We will update all the latest information directly from PS meeting. 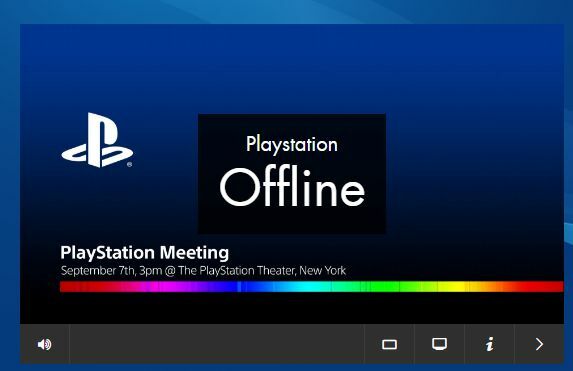 Live stream: Sony provides free live streaming of meeting on live.playstation.com and Youtube. You can watch the event live at the top of this screen. Bookmark this page by pressing Ctrl+ D or through your mobile browser. Stay tuned for latest news. Don’t forget to share. Subscribe for more updates.